Teletalk Bangladesh Limited is a public limited company, registered under the Registrar of the Joint stock companies of Bangladesh. Telecom is a fast changing dynamic sector. Continuous change in technologies and opportunities created by such change and consequent impact on the customer/user necessitates changes and adaptation of policies in the sector. Countries which respond timely and appropriately to such change grow successfully whereas others who fail, lag behind, remaining trapped in the vicious circle of poverty and under-development. Bangladesh being a developing country is fast trying to catch up with the developed world, and adapt its policies, in response to changing needs, opportunities and requirements in different sectors, including the telecom sector. Due to the inherent dynamism of the telecom sector and the speed with which the change is taking place therein, there is a convergence of technologies, of knowledge, expertise, experience, and of policies and strategies, to achieve defined policy objectives. In order to materialize the strategic vision behind liberalization of the telecom sector, the Bangladesh Govt. announced the national Telecom Policy 1998, with the main objective of creation of an environment of competition by establishing market oriented regime, appropriate sets of regulations, standards, procedures, conditions and investment climate so that the users have multiple choices for access to networks and market of different services, systems and carriers at a competitive and reasonable price. With a view to ensuring a level playing field for all operators in multi-operator environment, the Government in pursuance of the Bangladesh Telecom Act (BTA) 2001, established in July 2001, the Bangladesh Telecom Regulatory Commission (BTRC) which started its operation from 31st January, 2002. Previously, the Govt.’s Telecom Department BTTB, as per the Telegraph Act 1885, had the exclusive privilege of acting both telecom operator and regulator until 1995. Internship is a compulsory requirement for every student pursuing a MBA degree at the Faculty of Business Administration, International Islamic University of Chittagong (Dhaka Campus). I have working Teletalk Bangladesh Ltd. so that I have work for my internee report to find out existing problems on Teletalk. The topic was set after discussion with the internship supervisor at IIUC. This internship report on ”Financial Analysis of Mobile phone industry in Bangladesh ”A study of Teletalk Ltd is submitted on 6th June 2011. The broad objective of this study is to know about the Tele history of Bangladesh and analyze the present Customer Satisfaction of Teletalk Bangladesh Limited. and how to improving it. To measure the present and past financial condition of Teletalk and compare with each other. Find the financial problem and the solution from it. Questionnaire survey: I survey on dealers, subscribers and retailers and business market. My sample size is 40. But I consider the best 30 samples for implementing the information. It helps me to collect the information about the SWOT analysis of Teletalk Bangladesh Ltd and the market position of the company. Interview collection from Management: I cover up the face-to-face and telephone interview among the interviewee for getting the vital information. Conversion to the others: I have done the conversation among each other in the group and also discuses with my course instructor to institute the formation of report. A monthly business magazine on Mobile phone technology named “GSM Technology” published in the Bangladesh was extremely helpful for the study. This study could be more informative if more issues of the magazine could be collected. The magazine focuses on the Mobile phone technology all over the world. The prime secondary source was “Teletalk website”, Goggle website, monthly magazine; some information was collected from the Internet from various web sites. The major limitation of the report is that it is mostly based on secondary studies and partially on primary analysis. Another limitation of the report is that it does not at the mobile industry comparing other substitutes and present investment environment of the country. As, I had more dependence on the secondary sources, so there might be some level of inaccuracy with those collected information. Though, adequate verification and cross checking was used, to minimize the error level. Confidential information regarding past marketing and sales information was not accurately obtained. Alike all other business holders also very conservative and strict in providing those information. Still I had tried my best in obtaining that sensitive information, as much as possible. Many of the analysis on the obtained data are based upon my sole interpretation. This in result might bring some biases, as lack of knowledge and depth of understanding might hinder me to produce an absolute authentic and meaningful report. Teletalk Bangladesh Limited is a public limited company, registered under the Registrar of the Joint stock companies of Bangladesh. Total shares owned by the Government of the Peoples Republic of Bangladesh. We continue to grow and engage our customers through our clear commitment to offering high quality products and services as well as leading customer retention and loyalty programmers. Teletalk continues to be a part of the revolution that’s connecting millions of Bangladeshi people and around the world. Service provider in the country. It has already completed one year of operation. In this year Teletalk has a story of success as well as failure. On the other hand, there is still undesirable weak or no network in some important places despite its best and sincere efforts. Under these circumstances,the idea of establishing mobile telephone project (the project) in the public sector was conceived. Little of the Project was 10 ten Lakh T&T mobile telephone project (1st phase -2.5 lakh) at an estimated cost of tk 7.96 billion. At present situation Teletalk subscribers 3million but active subscribers 2.6 million. The ECNEC of the Government of the peoples Republic of Bangladesh decided to from a separate public limited Company for implementation and operation of the project. Then the Bangladesh Telephone & Telegraph Board (BTTB), having longest experience of serving in the telecom sector in Bangladesh, undertook initiatives to from the desired company in public sector. In view of the fact that formation of a public limited company involves considerable time and various relevant formalities, it was decided that BTTB should implement the project and operation thereof would be carried out bu the desired company. Subsequently, the assets out of this process would be taken over by the desired company to be formed. 2.5 Teletalk Participation in the share Market. After acquiring the assets and upon increasing the paid up capital by that extent, as the Government. Decision the board of directors the company has approved to go for IPO@40as %TBL of paid up capital i.e. 257 core )in the capital market. Such decision of the board has also been communicated with the ministry of posts and Telecommunications for obtaining further guidelines. Teletalk has created an unique outlet to acknowledge and encourage children’s art. With association from “Talent Promotion Initiative” Teletalk has arranged a children’s art competition, where children have engaged in a day long painting competition with Bangladeshi seasonal themes.Teletalk Bangladesh Limited then published a special “Billboard Calendar” based on selected pictures from the competitions. Teletalk initiated a helping program for Bushra – a patient of blood cancer. One can send SMS for Bushra to help raise fund for medical treatment. For a girl of 3 year old needing bone marrow transplantation, Teletalk’s unique way of extending help as well as including the community at large was appreciated. With the view described above, Teletalk Bangladesh Limited (the “Company”), being the only government sponsored mobile telephone company in country, was incorporated on 26 December, 2004 as a public limited company under the Companies Act, 1994 with an authorized capital of Tk.20,000,000,000. On the same day the Company obtained Certificate of Commencement of Business. 3. To meet a portion of unmitigated high demand of mobile telephone. 4. To create a new source of revenue for the government. To innovate and constantly find new ways to enhance our services to our customer’s current needs and desires for the future. Our vision is to know our customers and meet their needs better than any one else. The Company has obtained the Cellular Mobile Phone Operator License from Bangladesh Telecom Regulatory Commission (“BTRC”) on 1 September, 2004 for a period of 15 years. Initially the License was issued in the name of BTTB, and subsequently upon application, BTRC has changed the name of the operator as Teletalk Bangladesh Ltd. in place of BTTB. The Company has to operate within the GSM 900 and GSM 1800 bands as per slots allocated by BTRC. The Company was incorporated with an authorized capital to Tk.2000 crore divided into 2 crore ordinary shares of Tk.1000/- each out of which the paid up capital was Tk.22000/- dividend into 22 ordinary shares of TK 1000/- each. Since the Company inherited the BTTB Project of 10 (ten) Lakh T&T Mobile Telephone Project (1st Phase-2.5 Lakh), the relevant equipment and infrastructures necessarily were in the name of erstwhile BTTB (now BTCL). Upon approval of government, the Company on 21 May, 2008, by executing a Vendors’ Agreement with the Ministry of Posts and Telecommunications, has acquired all the equipment and infrastructures valuing 6,438,639,000/-,thereby transferring the title of the relevant assets in its own name. In consideration 6,438,639 fully paid ordinary shares of Tk.1000/- each have been issued in the name of the Ministry of Posts and Telecommunications. Teletalk initially started with the BTTB’s mobile telephone Project of 2.5 lac capacity. After implementation of the project by BTTB and operation of the same, the Board of Directors felt it necessary that in odder to thrive tn the stiff competitive market, Teletalk has to improve its services and expand its network on a continuous basis. With this end in view, the Board of Directors took up its expansion projects one after another. The first phase of the network expansion project was approved by the Board in June, 2006 with a cost of Tk. 200 crore. The project was destined to increase the subscribers base by 8 lac. The entire project has been implemented by huynds from its own resources. The Board of Directors has approved another expansion project of Tk.533 corr in July, 2008. This project has been targeted to increase its subscriber’s capacity by further 18 lac in its net. The project although has commenced on self-financing stages. Necessary L/Cs has already been established to import capital machineries. With technological development in the telecom sector, the Board of Directors of the Company has been thinking to implement 3G technology and expansion of 2.5G network simultaneously. The DPP of the Project has already been submitted with the government of Bangladesh for consideration. The cost of the project has been estimated a more than Tk.2,000 crore. A long term loan with simple terms and conditions is expected from the Chinese government of Bangladesh has been under active consideration of the appropriate authorities. The destined project, if implemented, would add further 5 lac subscribers in the network. After acquiring the assets and upon increasing the paid up capital by that extent, the Board of Directors of the Company has, on principle, agreed to off-load at least 25% of its shares in the capital market. Such decision of the Board has also been communicated with the Ministry of Posts and Telecommunications for obtaining further guidelines. The second phase of network expansion programme at a project cost of equivalent to taka5,330 million(including a foreign currency component equivalent to TK,2,730 million)financed from its own resources and partially by local banks has since taken off to yield a further capacity increase of 1.8 million of subscribers. At the initial stage, the pace of activities was somehow slow due to the Bangladesh banks regulatory measure; but with timely solution of the problem, that complicacy has been successfully overcome. However, after completion of the ongoing expansion programme, the total number of subscribers is expected 3.00 million. Teletalk Bangladesh Limited has continually expanded its network, to better accommodate its growing customer base as well as to keep the promise of providing better service. As of now, Teletalk has already established its network foothold in 64 Districts, 402 Upazilas, and most of the highways. Teletalk is continuing its network expansion to reach more corners of Bangladesh. approval of GoB, Feasibility study by Chain EXIM Bank and project planning have been done.After launching of the project Teletalk will able to play a significant role in the building Digital Bangladesh through e-education, e-Public health, e-Commerce,e-Government, High speed communication network services. The Company has country-wide strong telecom network covering 61 district headquarters, major upazillas and highways. It has 21 customer care centers throughout the country. Teletalk offers a wide range of services to its customers. Teletalk has different packages of like GPRS, Push-Pull services, SMS, Telecharge, Post-paid connection, Pre-paid connections etc. Like other operators, Teletalk has different value added services like, Color Ring Back Tone (CRBT), Pre-paid Bonus, E-Pay System. Teletalk offers a wide range of services to its customers. Following are an outline of the services presently available with Teletalk. Teletalk offers unlimited internet browsing facility for TK.800 per month or only 2 paisa per minute on actual usage basis for both post-paid and subscribers. One can use this facility by using data-cable in computer also. Handsets with GPRS option enable this facility. Through Teletalk GPRS, the subscribers can use the facilities like browsing, email, internet chatting, data transfer etc. Like ordinary SMS, one can receive answer to a question s/he asks. By using this push-pull service, one can have the latest updates of important events like cricket matches. Besides, other important information like weather forecast, prayer time, quotes, horoscopes and especially sehri-iftar timing during ramadhan are also available. An SMS of 160 characters each for TK.1.00 only available both in English and Bangla. Every subscriber of Teletalk gets the opportunity of Economy ISD / (EISD) to more than 50 countries @ TK.7.50 per minute. Under this facility, the subscriber should dial 012 (instead of dialing access code 00), then country code, then area code and finally the desired number. Teletalk, very recently, has introduced ‘Electronic Recharge’ system termed as ‘Telecharge’. This system enables the subscribers to recharge their accounts by any denominations within the range from TK.10 to TK.5,000. The subscriber is not required to buy any scratch cards for such recharge. Post-paid package has been designed for high user group, the entire country being considered as a single zone. The subscribers can select three numbers that provide them reduced tariff round the clock. At a connection fee of TK.950 only, it enables the user to have the facility of 1 second pulse and 3 fnf connectivity with no monthly line rent. Minimum monthly bill is TK.500 only but no security deposit. With connection fee of TK.590 only, Shapla provides lowest call charge of TK.40 at all time to any operator. This has additional advantage of migration from any post-paid connection. This connection needs minimum monthly bill of TK.1,000 with security deposit of TK.1,500 only. This has no line rent. The whole country is a single zone. This package also offers reduced tariff of two Teletalk numbers or one Teletalk and one T& T number round the clock. The first pulse is 30 second and the subsequent pulses are of 15 seconds. Colour Ring Back Tone: The subscribers will be able to define by themselves the ring back tone, if desired, to be heard by a caller. Pre paid Bonus: Pre paid subscribers will be given automated bonus package in terms of their volume of calls made from Teletalk. E-Pay system: By using this system, not only the subscribers of the Company, any person will be able to pay bill for his/her utility services through nominated agents of the Company without hassle of going to banks. Missed call Alerts: The subscribers, even if disconnected from network, will be informed (on re-connection) of all the calls made to his phone during the period of disconnection. The company has a board of Directors consisting of Chairman and Managing Director and Govt. High officials. Then One Board Secretary performs task as a representative of the Board of Directors. There are seven General Managers are responsible for different Departments. All GMs directly report to MD. Every GM is supported by Deputy General Manager, Manager, Deputy Manager and Assistant Managers. 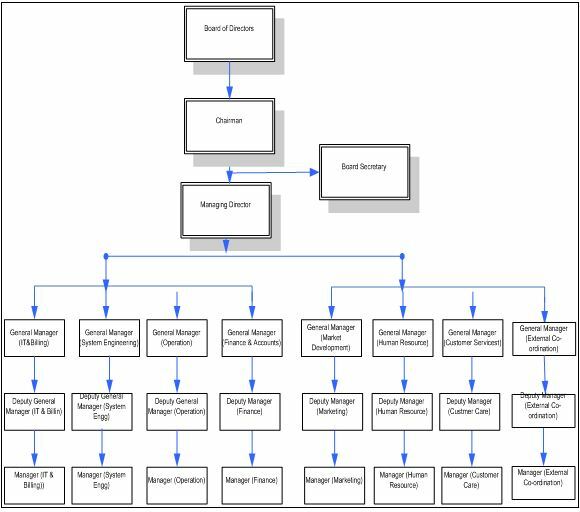 The diagram shown above is up to manager level of each department. There are some non-managerial posts such as Junior Officers and Associates; those mainly perform at the execution level of all operations. Teletalk provides various kinds of value added services. Some popular services of this category are Friends and Family (FnF), Push-Pull, Voice mail service, Bangla SMS, International SMS, Internet SMS etc Some VAS services are developed by this wing and some are procured from content providers. This wing of MKT is fully responsible for and initiating demandable services and selecting appropriate content providers for those. Tele Charge means a customer pays his bills directly from any stalls where the shopkeeper will receive money in favour of Teletalk and send SMS to Tele Charge system mentioning the paid amount of subscriber. Within a few minutes the subscriber’s account is recharged. This wing ensures the successful operation of this service. One of the major services of Teletalk is International Roaming. This wing of Marketing takes initiatives to make contract with operators of other countries. After successful testing between Teletalk network and the network of other parties, new roaming partner comes on live. Teletalk mainly sales SIM cards, Scratch cards to its dealers and customer care centers. And there many items which needs to distribute among the dealers. For example- when Teletalk launches new packages, some sorts posters are needed to distribute among the dealers. Teletalk does business with accumulating many dealers to distribute its SIM cards and many items. In reply dealer gets a commission on selling amount. To control, monitor and their commission processing this wing is busy all day. Present market condition, its trend, prediction & forecast, analysis of existing packages are the main working arena of this wing. Advertisements on print media an electronic media are provided from this wing of marketing department. The themes of lucrative ads on electronic media some times developed from this department and finally implemented from out sourcing. And advertisements on print media are completely prepared by the skill individuals of this wing. Corporate subscribers are the potential customers for any mobile company. This wing of MKT always tries to enhance this type of subscribers and ensures better services to them. There are two sections in System Engineering Department. These are given below. Planning Section is responsible for BTS link, Backbone, any necessary installation of specialized telecom hardware like Soft-switch, MSC, Intelligent Network etc and overall network planning. This department also provides any new concept to update the existing network. 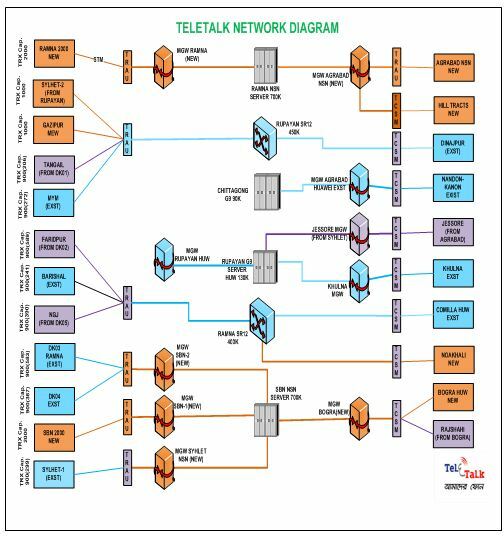 At present Teletalk has the following major network infrastructure. Civil: This wing performs the design works for tower of BTS. Earthling: In some cases BTS-tower requires some sorts of earting operation to test the feasibility of tower construction prior actual implementation. DC-Power: In the new site of network, the supply of DC-power is generated and finally tested prior implementation. Transmission: This wing is responsible to tie the new site under the existing network using the radio link. It consists of three antenna and two microwave links. Three antenna constitute three existing cells and two microwave link connects the new site with the nearest site and BSS. Installation & Commissioning: this wing receives network hardware from vendor companies and performs works for installation of new sites. When planning has been made then it is sent to the Procurement department to purchase the necessary product for the Project implementation. This department consists of several wings. Along with the description of different wings of this department a complete network diagram is presented here. BSS-Transmission: This wing simply ensures the connectivity from remote tower to BSS. Back Bone Transmission: It establishes the optical fiber connectivity across the Teletalk network element. Teletalk has two soft-switches, important network element for mobile connectivity. This wing mainly performs all operational and maintenance activities of these elements. This wing is actually concerned about the network element, Intelligent Network (IN). IN can be thought of as the billing system for pre-paid users. MSC, the switches, are the concerning part of this wing. Some highly skilled and trained employees of Teletalk are responsible for its operational and maintenance activities. IT & Billing combines the Post-paid Billing section and the Information Technology part of Teletalk. So there are two streams of workflow exists in this department. This part involves the activities of New Subscribers activation, ensuring accurate charging, accuracy of all payment records and in-time delivery of monthly invoices to the customers. This part also includes the task of ensuring the benefits and services received by Post-paid subscribers. This is one of the important functions provided by Billing. Activation of Roaming service, ensuring correct charging of in-roamer and out-roamer and performing test for selection of new roaming partners are some major task of this wing. This function is to revenue sharing among all other telecom operators in Bangladesh. Teletalk Billing system has a wing of Partner relationship management where this task is executed. Here invoices are prepared for both the receivable and payable. Other operators also prepare this type of invoices and send those to Teletalk. Then reconciliation has been performed and actual receivables and payable amounts are determined. Post-paid packages are the non-tangible products of Mobile Company. Through this lots of attractive features and benefits are combined in order to pursue the mass people to use their mobile services. It’s a very common scenario for a mobile company to change their packages and benefits within very short time. This part of billing section performs this sort of changes in Post-paid packages of Teletalk. The functions of this wing are divided into six categories. This is the most important function of IT. Any extensions of existing network among all the sites of Teletalk are performed with the involvement of the officials of this section. All the sites of Teletalk are under the network of IP-PBX system. IT has the full responsibility to implement and maintenance activities of IP Phone system. IT section has some skilled employees who solve the day-to-day problems of computer peripherals used in all departments. Another inventory has been maintained for this purpose. This is another on-demand function of IT section. Teletalk owns the office automation software such as Enterprise Resource Planning(ERP). IT has the sole responsibility to familiar this product among the employees through proper training and must ensure the effective use of this software. The time-to-time maintenance is also task of IT. IT section also performs some development works such as the website of Teletalk, Automated cheque printing software, commission calculation of dealers are some examples of development works. Teletalk must follow the written PPT (Procurement Policies of Teletalk) to purchase any thing. Depending on the situation, Teletalk uses various kinds of procurement method, such as common, special, limited and restricted categories of tenders, Direct Quotation Method (DQM), Spot Quotaion Method (SQM), Purchase from Open Market (POM) etc. this department also determines the policies of frame work i,e way of receiving goods either within three months, six months or in a year. Based on the source of procurement, it has two wings. Teletalk needs to procure many items from the local market such as AC, generators, Laptops, PCs, Servers, tower construction equipments etc. All special categories of telecom hardware equipments are bought from foreign countries. For example, MSC, CRBT Intelligent Network (IN), Billing Servers, Soft-switch etc. Except that Teletalk also purchase SIM cards and sometime scratch cards from foreign countries. This department mainly exchanges information with the outsiders. There are two wings through the department is functioning its activities. Some regular reports are sent to Bangladesh Telecommunication Regulatory Commission (BTRC). For example total number of subscribers, total number of BTS etc. Since Teletalk uses frequencies assigned by BTRC, the charge known as Spectrum Charge are paid through this department. Further more the license fee is also paid through this department according to the instruction of BTRC. These are all about the out flow of information from Teletalk. On the other hand, if BTRC proposes new rules and regulations, the Teletalk is informed through this department. Except that the guidelines of designing service packages are also received from BTRC. Sometimes this wing performs some promotional activities or deciding to be sponsor of any welfare activities. At present an association has been formed among the mobile operators of Bangladesh, called AMTOB (Association of Mobile Telecom Operation in Bangladesh). Being a member of the association, this wing provides all sorts of reports and transmits its comments on every conflicting issue on behalf of Teletalk. Teletalk is a service company and obviously the customers are the life of Teletalk. Customers’ satisfaction is the earnest goal of this company. And this department acts as a medium to communicate directly with customers. So, from the organizational point of view customer care contains huge significance among all the departments. In all divisional districts Teletalk has set up customer care centers. At present there are eighteen customer care centers in all over Bangladesh. This wing performs the most important task for Teletalk like fund management where the source of funds and its allocations are managed. Since Teletalk involves lots of foreign purchase, LC open and its accounts maintaining is also a part of work of this department. Vat calculation and its proper transformation from one end to other end is also ensured from this department. The Finance section performs various financial activities such as yearly budget formation, Monthly Inter Operator Billing, Revenue Calculation from different sources on daily basis, Performing cross checking of bill collection with Billing department, monitoring bank balance before and after all sorts of operation, dispute analysis on operator basis and on source basis. This section does Accounts design, Inventory maintenance design, A/C Transaction, Annually financial statement based on IAS-International Accounting Standard, MIS report. VAT at time of Procurement and payment to contractors to ensure the VAT and Income Tax rule and regulations, maintenance of bank Account maintenance and to assist to external auditor. Human Resource Department plays a vital role in the overall process of the company. With the passage of time, the importance of HR-department is drawing significances, since Teletalk expanses from its initial stage and many people are involving with this advancing journey of Teletalk. At present more than three hundreds of employees are working in Teletalk. Considering the present job responsibilities, HR is sub-divided into several wings. This wing works for leave management, medical & transport facilities, welfare allowances and every legal affairs of the company.  Teletalk is the only one state owned mobile company of Bangladesh. Being a part of Government administration, Teletalk enjoys lots of administrative and business benefits. For example: The government of Bangladesh has given license of 2.5G & 3G network to some of the existing mobile operators(The implementation of the project is proposed as january 2011 to December 2012). Teletalk owns this license only because it’s state owned company.  Among all the operators Teletalk was given the privileges to publish S.S.C./ H.S.C., Degree results. Just because of the initiatives of the Government, Teletalk enjoys this privilege.  Sometimes Teletalk runs with some sorts of financial crisis. At that moment Governments can arrange or manage loans to overcome the crisis.  Along with the additional privileges, Teletalk owns a highly qualified bunch of professionals whose dedication and hard work have great impacts on the achievements of Teletalk.  The major weakness of Teletalk is the slowness of the decision making process. As a result it sometimes compels to face some unwanted competition among other companies and sometimes it even incurs losses. Since telecom is one of the growing sectors in Bangladesh, dynamic decisions should be taken at proper time.  Being a mobile company, the success depends on the expansion of network as much as possible and effective marketing with required customer cares. So, the co-ordination among those important fields is the most important factor to sustain in the competitive market. Teletalk is lagging this sort of co-ordination from the standard mark.  People of Bangladesh naturally like to use the country products very much and they are inspired to use Teletalk’s service with true patriotic feelings. Getting consistent with this emotion, Teletalk represents itself as “Amader Phone” and says to mass: “Keep Country’s Money within the Country”. If Teletalk provides similar services like other foreign companies, obviously people will welcome Teletalk with great care.  Teletalk has become profitable government companies because of true dedication and day-night efforts of its all staffs who are highly qualified and experienced. If their contributions are evaluated by the Teletalk management with care and incentives, bonuses, performance appraisals can be provided with a timely fashion, existing employees will be highly motivated to create any radical advancement of Teletalk.  Although Teletalk is a state owned mobile company, it contains a very few market share. The maximum market shares are occupied by Grameen Phone, Banglalink, Robi and other foreign companies. Teletalk faces tremendous competition in the mobile industries because of these highly equipped foreign organizations. If one company lessens the call rate, the other companies also offer lesser rate. Since Teletalk is a governments’ company, government can interrupt the usual decision flow of the organization, which in turn may cause unnecessary delay in activities. So, sometimes the government itself acts as threat. Tele density of Bangladesh is still the lowest in South Asia. The Bangladeshi telecommunication industry has been now facing global competition as different multi-national telecommunication companies have been trying to penetrating into this market. Hence, the existing phone companies have been loosing their competitiveness and market-shares. To retain market-share, existing local companies have been pursuing to fulfill the need gap of phone services in different regions of Bangladesh. ü To meet a portion of unmitigated high demand of mobile telephone. ü To create a new source of revenue for the government. The Telecom sector of the country has been liberalized for private investment. Bangladesh T&T Board provides all types of telecommunication services in urban and rural areas while the mobile, paging and radio trunking services are offered by private operators. Private operators were also given license to install and operate digital exchanges in rural areas and they would install telephone exchanges in phases. Table-1 shows the list of the private operators. ü Agriculture information services for the farmers and also for the end users, like product price in different parts of the country. ü Product ID for all consumer products/ Organization. ü Interactivity between Government and the Citizens. Most of the mobile users have been found subscribers of pre-paid connections. The reasons behind using pre-paid mobile connections. ‘No hassle of bill payment’ has been found to be the most mentioned reason by the pre-paid mobile users (84%). ‘Availability of cards everywhere’ has been found the next mentioned reason by the prepaid mobile users (12%). The scenario is quite similar in all four regions of Bangladesh. Post paid mobile users have also mentioned reasons behind their preference. The major reasons behind using post paid mobile connections. ‘Low call rate’ has been found to be the most mentioned reason by the post-paid mobile users (74%). The scenario is almost similar in all the four regions of Bangladesh. Nearly two-fifths of the respondents have mentioned that on an average they receive less than 5 calls per day (39%). Almost the same number of respondents receives 5-7 calls per day. Regarding the outgoing calls, it should be mentioned that 59% of the respondents make less than 5 calls, while 31% make less than 5-7 calls per day. have reported that the duration of most of their calls is less than 5 minutes. Most of the users opined that they use phone service for personal reasons (52%). However, about half of the respondents use for both personal and official/business related reasons (44%). Two-thirds of Grameen phone users have responded that they like the network availability. One-fifth of the users of Grameen phone have expressed that they like My Time, My Easy Time, My Jones, etc; whereas 46% of them dislike higher call rate of Grameen. Pulse facilities given by Robi (Aktel) liked by 31% of Robi (Aktel) users while the and lower call rate is liked by 24% of them. Lesser availability of the network (29%) and high call rate (22%) are the key disliking factors to the Robi users. a. First mobile operator to give ‘Free incoming’ to all subscribers. b. First mobile operator to give ‘BTTB Connectivity’ to all subscribers. c. First mobile operator to give ‘ISD & EISD Facility’ to all subscribers. d. First mobile operator to introduce ‘single-Zone country wide Network. e. First public sector enterprise to introduce e-governance. A net amount of Tk.3,506007 representing receivable from PCO clients and post paid subscribers appears doubtful of recvery The board of Directors therefore recommends making a provision for the same amount in the financial statements under review. However, the management has taken due care to recover the doubtful debts within shortest possible time. Its is the responsibility of the Directors as per the of the Companies Act,1994,to prepar financial statements for each year. The financial statements and other financial information included in this report fairly present all material aspects,The financial conditions,results of operations, cash flow statement and the charges in equity of the company for the year under review. The Company has used appropriate accounting policies in preparation of these financial statements supported by reasonable and prudent judgment and estimates as necssary international Accounting Standards (IAS), as applicable in Bangladesh has beenfollowed in preparation o these financial statements in compliance to the relevant accounting principles..
Teletalk Bangladesh Limited (hereinafter referred to as the Company)was incorporated as a public limited company on 26 December 2004 with an authorized capital of BDT 20000000000 dividend into 20000000 ordinary shares of BDT 1000 each. The Company obtained the Certificate of Commencement of business from the Registrar of join Stock Companies and Firms on the same day .The Company is wholly owned by the Government of the peoples Republic of Bangladesh and represented by various ministries and Bangladesh Telephone Board (BTTB) presently BTCL. The principal activities of the company are to promote and develop telecommunication and ancillary service,to promote and undertake programs or activities to extend wireless and cellular mobile telephone service, to enable the people to resell telephone service on a commerciall basis and also to develop a network that would meet the telecommunication needs of the subscribers and to provide access to similar services at a most competitive price. The financial statements have been prepared on going concern basis under the historical cost convention on Generally Accepted Accounting Principles (GAAP) in accordance with the Bangladesh Accounting Standards (BAS) and Bangladesh Financial Reporting Standards (BFRS), Companies Act 1994 and other applicable laws and regulations. The Company has been experiencing operating losses during last few years, negative cash flows during the period, working capital deficiencies and adverse key financial ratios. However, the management has reviewed the projected cash flows and profit forecast and concluded that the Company is expected to overcome the present situation in a foreseeable future. The Company’s projected cash flow and profit is supported by the fact that it will increase its subscribers. As a result, the Company does not anticipate any adverse situation that may affect the going concern status of the Company. Properties, plants and equipments are stated at cost less accumulated depreciation. Cost includes expenditure directly attributable to the acquisition and installation of the assets. Any repairs and maintenance to the assets are charged to the income statement as expenses during the period when these are incurred. Depreciation on properties, plants & equipments has been charged on straight-line method considering the economic and technical lives of the same. Full year’s depreciation is charged on assets during the period of acquisition irrespective of its date of acquisition and no depreciation will be charged on assets during the period of disposal. For the purpose of these financial statements, proportionate depreciation has been charged therein. statements amortization has been charged proportionately for six months. This represents expenses incurred before commencement of commercial operation of the Company. These are amortized over a period of three years from the year of incurrence of commercial operation. For the purpose of these financial statements amortization has been charged proportionately for six months. Deferred expenses representing project implementation cost, documentation fees and training expenses has been charged in these financial statements with a view to write off in 4 years commencing from the period of incurrence of such expenses. For the purpose of these financial statements amortization has been charged proportionately for six months. Inventories include SIM card, scratch card, cash cards and mobile sets. Those are measured at the lower of cost and net realizable value. Cost is determined using the weighted average costing method. Stocks of service handsets for employees are valued at original cost. These are charged as expenses at the time of issued for employees. Sundry debtors consist of receivable from distributors, dealers, inter-operators and unrealized bills for network revenue which are recognized at the balance sheet date. Current income tax is recognized on the basis of company’s computation based on the best estimated profit for the period at the rate of 45% pursuant to provisions of Income Tax Ordinance 1984 and the relevant Finance Ordinance. Despite of having no taxable income a tax provision @ 0.25% of total turnover has been accounted for in accordance with aforesaid Finance Ordinance. Transactions in foreign currencies are converted into equivalent BDT applying the ruling rate at the date of such transactions. Assets and libabilities outstanding at 30 june 2009 denominated in foreign currencies have been shown in BDT at the rate in terms foreign currencies ruling on the Balance Sheet date. Prepaid network revenue is recognized (exclusive of VAT) as per actual usage of prepaid (scratch) cards recorded in the unused portion cards remains as unearned revenue and recognized as liability of the company. Prepaid network revenue is recognized (exclusive of VAT) as per actual usage of prepaid (scratch) cards recorded in the network. The unused portion of the prepaid cards remains as unearned revenue and recognized as liability of the Company. Postpaid network revenue is recognized on accrual basis and recorded as income (exclusive of VAT) on delivery of the bill to subscribers on a monthly basis. Interconnection revenue consists of charges imposed to other cellular operators for receiving calls from their subscribers’ cellular numbers. These are recognized as per invoices raised on a monthly basis. Roaming revenue consists of charges imposed to other cellular operators outside Bangladesh for using the network of the company in the country. It is recognized as per invoices raised on a monthly basis. Handsets revenue is recognized at the time of sale of subscribers’ set. Connection revenue is recognized as income when SIM cards are sold and delivered to the subscribers. This represents charges realized from subscribers in case of new SIM cards and recognized an income when received. The amount of charges received from subscribers for rendering various service provided to them, and it is recognized on collection basis. 4.3 Ratio analysis of Teletalk Bangladesh Ltd.
Telltale’s acid-test is weak. Strong current ratio and week acid-test indicates a potential problem in the inventory account. Teletalk financed by long – term debt utilization ratio 0.11, 0.18 and 0.17 in the year 2010, 2009 and 2008. Teletalk Bangladesh Ltd. gross margin ration increase 2008 to 2010. Teletalk Bangladesh Ltd. net margin ration decline 2008 to 2010. Teletalk Bangladesh Ltd. Return on Investment ratio is falling 2008-2010. Teletalk Bangladesh Ltd Return on Equity ratio is falling 2008-2010. Simply capital structure defined as a mixture of Debt and Capital or Financing mix. It’s depends on the nature of the firm and manager intensity. It could be 100% of equity. There are thousand of combination is possible in the capital structure of Firm. The mixture of capital structure which balancing the risk and return of investment in a flexible way and reduce the cost of investment. is called Optimum capital structure. When the expected returned don’t matches with the actual return then it’s consider as business risk. Business risk is arises from ineffective operation of the firm which is also called systematic risk. Deviation occurs because of low quality of products, weak marketing channel, less demand for products. When the firm has rules of Turing the debt holder to share holders then the firm trends for debt issuing would be more. So this factor has an impact on the capital structure. If the manager of firm is aggressive in nature, they would like to take more debt in order to take tax advantage and risk of the firm also increase proportionately. Other hand, if the manger is conservative in nature who doesn’t like to take risk, he may not issue debt. If the firm has any fixed cost item in its capital structure then the firm should not issue more debt. The higher would be the fixed cost the higher would be the risk. Fixed cost item are debenture, preferred stock. By the above analysis I find the following problems in Taletalk Bangladesh Ltd. Finance wings.  Shortage of working Capital.  Insufficient fund for new investment.  Shortage of fund for network expansion.  Problem for quick Decision making.  Poor Work Delegation Structure.  Lack of co-ordination among the employees & departments.  Lack of potential and efficient employee.  Lack of accounting information system.  Poor reputation among customers.  Packages are not so lucrative. Subscribers are not conscious about all packages & Value-Added Services. Lack of after sales service.  This fund may be collect by short term lone.  Fund may be collect by IPO.  Teletalk Bangladesh Ltd has some opportunity to get soft lone from china. This lone may be paid by 15 years.  Collect short-term loan from Commercial Bank.  Teletalk Bangladesh Ltd. can take the soft loan for new investment.  Ensuring Improved Network Quality for the satisfaction of the customer.  Employing qualified employee & make perfect them by proper trainning.  Improve the Interaction between the employees and make them helpful to each other.  Improve the Logistic system by a systematic way. 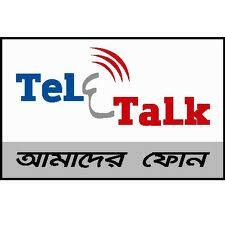  Teletalk Bangladesh Ltd. main revenue comes from the Dealers sales so that Teletalk Bangladesh Ltd. must be improving the Dealers Management system.  Teletalk Bangladesh Ltd. can improve the Accounting information system by implementing a Central software system.  Teletalk can decrease the inventories by improve the sales by implementing different Marketing strategy. At last we can Say that Teletalk is a growing up but at present the Company no profits, After three year Teletalk Ltd profitable Sectors because new technology 2.5G,3G established in the Company. At present Teletalk ltd subscribers 3 million but active subscribers 2.6 million. Teletalk try to providing and to do so, it has established country-wide strong telecom network coverage at all districts, upazillas and Highways. Teletalk established 23customer care Center, 22,420 SIM Retailed center, 520 SIM Replacement Point, 30,090 Telecharge Centers and 79 number of countrywide. Also Teletalk has international Roaming services with 54 operators of 38 countries worldwide.